On the face of it, opera “in concert” is a near impossibility. Opera is an art form that combines live theatre and music, with sets, costumes and the whole nine yards; to present it in concert form is to eliminate most of what makes it what it is; on the other hand, the music alone in many operas is so magnificent that the elimination of a full theatrical presentation can easily be justified, and in some cases, the theatrical elements are so inferior that one is better off without them. In Beethoven’s opera Fidelio, we have a good example of a score that is easily able to stand on its own in concert, and Jaap van Zweden, his orchestra, chorus and soloists made an excellent case for this kind of presentation. Musically Brilliant But Lacking Visual Cohesion? Van Zweden has recorded all the Beethoven symphonies in Holland, and more recently recorded two of them with the Dallas Symphony. We already know that he likes his Beethoven intense, fast, dramatic, detailed and historically informed. All these characteristics were evident in this Fidelio performance; gripping from beginning to end, it was also often beautiful. Fidelio, however, is neither a symphony nor an oratorio. It has a story and the characters do interact with each other; unfortunately, in this concert performance there was too little of the latter. To be fair, Marcel Reijans (Jacquino) and Simona Saturova (Marzelline) did dialogue to some extent, as did Arthur Woodley (Rocco) and Robert Bork (Pizarro); most importantly, however, Lisa Milne (Fidelio/Leonore) and Robert Dean Smith (Florestan), the couple at the centre of the action barely acknowledged each other at all. In the last half hour, the story of the opera requires them to be in each other’s arms. Instead, they stood on either side of the conductor’s podium mostly staring into the audience instead of into each other’s eyes. Leading the cast was Lisa Milne as Leonore, the courageous woman who comes to the prison in disguise to rescue her husband, the political prisoner Florestan. Her voice is lighter than that which we usually hear in the role (i.e., dramatic soprano), and this presented a problem in her great aria “Abscheulicher! Wo eilst du hin?” At times Milne, who clearly has a solid technique and a beautiful voice from top to bottom, struggled to be heard above the horn section. This balance issue raises several points: on the one hand, she would have had no problem being heard in an opera house with the orchestra in the pit; on the other, a concert setting allows the audience to hear Beethoven’s orchestration up front, in all its glory. This was a performance in which van Zweden obviously wanted to hear his horn players. In Leonore’s aria, “Abscheulicher! Wo eilst du hin?” and in the introduction to Act Two, they were incredibly powerful. Some would say that they were “too powerful” and blame the poor balances on the conductor. To my mind, they were just fine. As does van Zweden, I like my Beethoven strong. Beethoven played with caution and excessive restraint is no Beethoven at all. Tenor Robert Dean Smith was her Florestan and he too has a voice that is more lyric than dramatic. Anyone who was fortunate enough to hear Jon Vickers deliver Florestan’s first words, “Gott! welch’ Dunkel hier” knows what power and passion can do for this role. Mr. Smith was always in tune and in control – a fine tenor voice; unfortunately, the role also requires the occasional show of temperament and abandon. After all, this is a man who has fought for freedom and justice and who now finds himself unjustly locked in a dungeon, with every expectation he will die there. Mr. Smith’s interpretation was just a little too moderate and comfortable for a man in Florestan’s predicament. In the role of Pizarro was baritone Robert Bork, also not what one expected. Pizarro is a cruel and nasty character and one usually sees plenty of teeth-grinding and lip-curling from the singer in the part. Not so with Bork. He underplayed the physical possibilities, and it worked. After all, there are plenty of nice-looking people walking among us who are evil to the core. Bork has a big voice and uses it with great musicality, two facts which made his characterization that much more convincing. From a musical point of view, there were no weak links in the cast. Soprano Simona Saturova, who has an uncommonly beautiful lyric voice, was particularly impressive as Marzelline. The success of this concert performance of Fidelio was also due in no small part to the chorus. In most opera houses, the Fidelio chorus numbers at most 30-50 people. 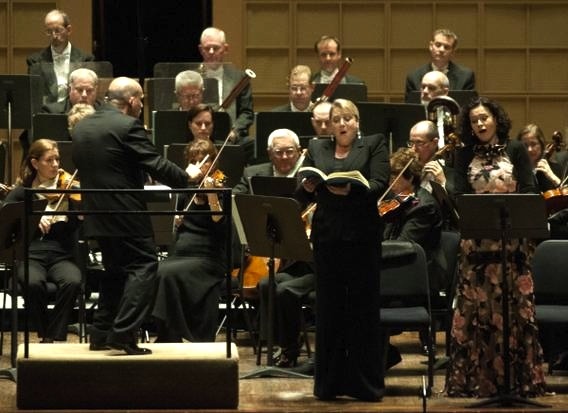 For this in-concert version of the opera, we had no fewer than 190 voices, those of the Dallas Symphony Chorus, which had been well-prepared by Joshua Habermann and was absolutely galvanized by Jaap van Zweden in this performance. Diction and rhythm were precise, and the dynamic range was staggering. As is so often the case in Dallas these days - in spite of the shortcomings I have mentioned - what ultimately made this Fidelio memorable was the leadership of Maestro Jaap van Zweden. His attention to detail was amazing and the intensity maintained from beginning to end was remarkable. He continues to build the orchestra into a disciplined and electrifying instrument that can excel in a wide variety of musical styles. The latest changes in the orchestra under van Zweden were in the afore-mentioned horn section. Earlier this season it was announced that longtime principal horn Gregory Hustis would be stepping down. The DSO is currently looking for a replacement and for the Fidelio performances invited Jonathan Boen, principal horn in the Chicago Lyric Opera Orchestra, to sit in as a guest, and presumably as a possible successor to Hustis. In the final scene of Fidelio, Beethoven hammers home the message that preoccupied him his whole life, which was to be given its ultimate form in the Ninth Symphony. Beethoven lived in a time of revolutionary turmoil and he was clearly on the side of the common folk in their struggle against noblemen and dictators. The opera affirms the idea that all men are brothers and need to fight against oppression wherever they find it. The second message in this opera is that faithful/steadfast love between a husband and wife means that each is prepared to give his or her very life for the sake of the other. 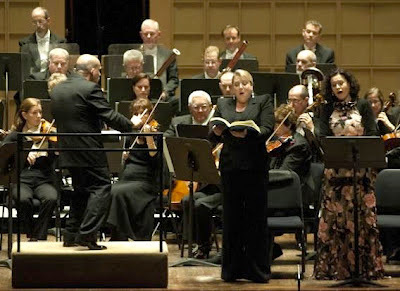 Even two hundred years later, these messages, set to music of such elemental power and joy, are as inspirational as ever; they are the heart and soul of Fidelio and Jaap van Zweden, his musicians and singers conveyed them to their Dallas audience with the deepest conviction and artistry.